The 1860 Federal Census reveals that 21 year-old David B. Woodbury then lived in Norwalk, CT with the family of photographer and former jeweler & daguerreotypist — Edward T. Whitney. After learning wet-plate photography from Boston’s famed photographer J.W. Black, Whitney moved to Norwalk, CT in 1859 from Rochester, NY. 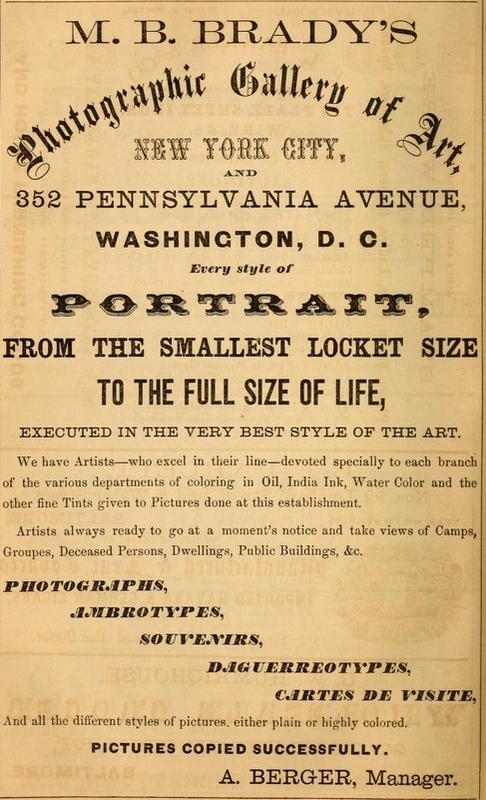 Ad in June 15, 1855 Humphrey’s Journal of Photography Vol. 07, n0. 4. It is very likely that David B. Woodbury first met and worked for Edward T. Whitney in Rochester because the Woodbury family relocated from Vermont to Rochester after 1850 but sometime prior to the taking of the 1855 New York State Census when David was 16 years old. Consequently, David probably moved to Norwalk with Whitney in 1859. “[ I must allude] to the valuable aid and instruction I received from Mr. A. W. Paradise [in New York City in the late 1840s], who was Mr. Brady’s right-hand man so many years, and who afterward became my partner in business. Also to the courtesy extended to me by Brady and Gurney, in whose galleries I was accorded access … In 1859, my health becoming impaired by use of cyanide, causing constant headache and weak eyes, I went to Norwalk, Conn., to recruit. In three weeks I recovered my health and decided to sell out in Rochester. Leaving a successful business, I returned to New York, opened a gallery at 585 Broadway with Mr. A. W. Paradise, also one in Norwalk, Conn.
Mr. Whitney’s account gives us a nice general overview of some of David B. Woodbury’s Civil War experiences for the period of 1861 through part of 1862. But what of the rest of the war? The “Mr. Burger” who accompanied Woodbury to Gettysburg on November 19, 1863 undoubtedly is Anthony Berger who had journeyed with Woodbury to Gettysburg from Washington, D.C. in July of 1863 shortly after the conclusion of the great battle [Berger is best known for a number of photographs he took of Lincoln at Brady’s Washington, D.C. studio, the most recognizable of which graces the U.S. Five Dollar bill]. After several days of familiarizing themselves with the Gettysburg battlefield terrain, they were joined in mid-July by their boss, Mathew B. Brady, whereupon they recorded a number of photographic views. 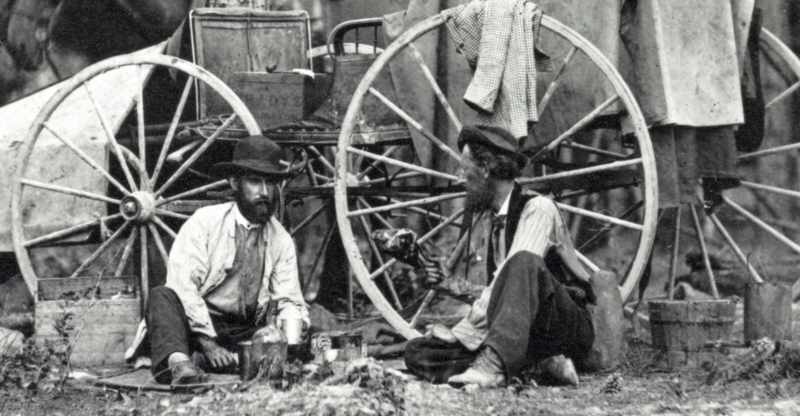 Thus, Messrs. Woodbury and Berger were quite familiar with Gettysburg and some of its inhabitants from their extended visit to that place a mere four months earlier. 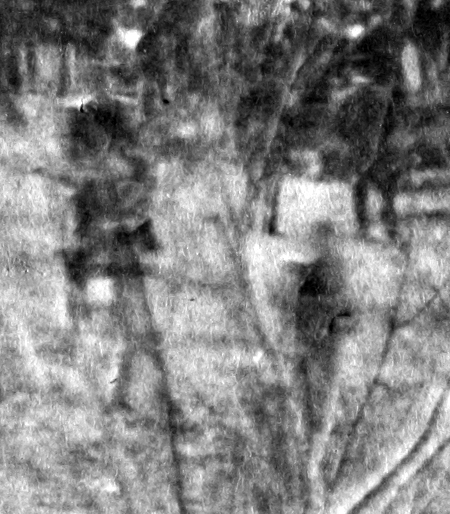 Of the nine known photographs taken in Gettysburg on November 19, 1863, none are attributed by modern day scholars or photo-historians to David B. Woodbury, Anthony Berger, Mathew B. Brady, or anyone else who then worked or freelanced for Brady. The first page of David B. Woodbury’s letter to his sister Eliza reveals that he was in Gettysburg on the 19th of November and took photographs there “of the crowd and Procession” with another Brady man, Anthony Berger. It leaves us wondering what other nuggets of information are inscribed in Woodbury’s November 23 letter, including descriptions of the events of the day and whether he and Berger took any photographs on the cemetery grounds. This single letter may or may not contain extraordinary information previously hidden from historians (other than Ms. Cobb) about both the dedication event and the photographs that these two men created. Detail (below) from a photograph (LC) taken looking out over the Gettysburg Soldiers’ Cemetery grounds on November 19, 1863 shows a photographer on a ladder above his assistant, to the right, who is standing next to an apparent portable darkroom on a tripod. The view of them is slightly impaired by some leafless tree branches but there is no doubt that these men were photographers. Might they be David B. Woodbury manning the camera while perched atop the ladder and Anthony Berger standing next to the portable darkroom? Some other questions have to be asked out loud — is it possible that Woodbury and Berger created any of the known Gettysburg images, such as, for example, the photo taken from a second floor window of the Evergreen Cemetery gatehouse attributed by William A. Frassanito to Peter S. Weaver (which would rule out them appearing in the above detail) or even the famous photo depicting Lincoln which Mr. Frassanito and others credit to David Bachrach? Might some or all of the Woodbury Gettysburg photos still await discovery in a dusty attic or a long-ago sealed box? Or were all of the glass plate exposures created by those men in Gettysburg on the 19th of November destroyed or placed somewhere forever out of our collective reach? Irrespective of the answers to these questions, the David B. Woodbury Collection may well constitute a gold mine for research into one photographer’s actions and experiences in Gettysburg on November 19, 1863 as well as at different times and places during the war. Alexander Gardner mentioned in passing in his Sketchbook that he “attended the consecration of the Gettysburg Cemetery, and again visited the ‘Sharpshooter’s Home. '” David Bachrach commented briefly on his Gettysburg experience in a 1916 article, noting that he “did the technical work of photographing the crowd, not with the best results with wet plates, while Mr. Everett was speaking” and was then displeased with the 8″ x 10” “negatives” he took. Peter S. Weaver’s father wrote on November 26, 1863 that he “assisted Peter of getting a Negative of the large assembly on the Semetary [sic] ground, which I think is very fine, we have not as yet printed any Phot. of the Negative …” But it remains to be seen whether David B. Woodbury wrote in even greater detail elsewhere in his letter to his sister, some other letters, or within his diary about what he did and experienced in Gettysburg. Let’s hope that someday sooner rather than later the David B. Woodbury Collection is made available for scholarly review and analysis so that some of these questions can be answered and other new ones can be asked. In the mean time, the names of Messrs. David B. Woodbury and Anthony Berger appear to merit being added to the short and exclusive list of known Gettysburg dedication ceremony photographers.